Asking people how their symptoms are affected when they go on holiday abroad could help doctors determine genuine allergies from suspected ones. That's according to research from the University of Edinburgh which pinpoints 4 simple questions people could be asked. - Do you have, or have you ever had, hayfever? - Do any of your parents or siblings have, or have they ever had, hayfever? 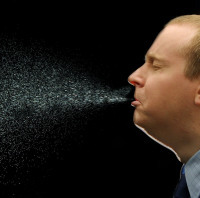 - Do your allergy symptoms vary when you go from place to place (for example, on holiday)? - Is there a specific trigger that always sets off your allergy symptoms? Anyone who does suffer with hayfever should make sure they've arranged appropriate travel insurance before travelling abroad. The quick test could help identify those who mistakenly believe they have an allergy, researchers say. They developed the questions to help lessen the burden on NHS resources. The team also hopes to help patients save money. Those who believe they have an allergy will often spend money on treatments without actually having it diagnosed, they say. Currently people who suspect they have an allergy have blood tests and skin prick. These tests were compared with the questionnaire in 143 people. The majority of those answering 'no' to all 4 questions were found to not have an allergy. The researchers said: "Most (87.5%) of those who gave negative responses to all the questions were non-atopic (had negative skin tests)." Allergy UK's head of clinical services, Amena Warner, said: "There are clear Nice (National Institute for Health and Care Excellence) guidelines on recommended testing using the appropriate allergy tests of either a specific IgE blood test or a skin prick test. "Of course, as a national charity committed to helping improve the prompt diagnosis and treatment of allergic disease, Allergy UK welcomes new research and we await the outcomes of a larger study to validate the screening questionnaire." The study was published in the British Journal of General Practice.